It looks like the city will require parking for new homes and businesses on lots where parking wasn’t required before, and the new mandates will be especially burdensome for taller buildings. That’s the takeaway from a task force meeting today led by City Councilman Albus Brooks. A few vocal neighbors freaked out over various projects earlier this year when developers began planning apartment buildings without parking spaces on parcels of 6,250 square feet, a common lot size in Denver. The opponents’ argument was that newcomers will “take” “their” on-street space for private car storage. The buildings are legal. (Well, they were.) The city doesn’t require parking for these lots because car-lite development in mixed-use neighborhoods is a good thing — it makes the city more walkable and cuts down on traffic. Building parking also isn’t cheap — it runs to $18,000 to $26,000 per stall, costs that constrain how much housing will be built and result in higher rents for tenants. Making housing less affordable while increasing car traffic goes directly against the City Council’s stated priorities — not to mention the Hancock administration’s massive planning process that’s supposed to free Denverites from car dependence. Other American cities are reducing parking minimums in an attempt to lower barriers to housing construction and cut traffic. Denver did so with Arapahoe Square, but with this rezoning, the city will be going in the opposite direction. City Council buckled to the all-powerful parking lobby and pressed pause on the parking requirement exemption this summer, after grandfathering in projects already in the pipeline. The Council formed a task force to hammer out a compromise, which was the subject of today’s meeting. For properties along frequent transit corridors, the first three stories are exempt from parking minimums. After that, the city will require .25 parking spaces per unit. For properties outside of frequent transit corridors, the first two stories are exempt from parking minimums. After that, the city will require .25 parking spaces per unit. Developers of these small lots can negotiate their parking spaces down to zero if they build near good transit and bike-share, for instance, or provide trade-offs like car-share spaces on- or off-site. Currently developers can only negotiate down to half of the required parking in a given district, but this change allows them to eliminate it altogether. Existing buildings are exempt from providing parking. The 100-home developments at 16th and Humboldt that sparked this debate would be required to have 26 parking spaces if they weren’t grandfathered in. “It’s too heavily trying to solve transportation issues, which was not our main goal,” he said. But Hickman’s goal revolves entirely around transportation, in the form of private cars. Hickman and his cohorts don’t think the proposal does enough to lessen the “impact” car-free developments have on neighborhoods. The impacts of car-free development that Hickman overlooked include more affordable housing and walkable streets, not to mention more transit and biking options if developers opt for them instead of building parking spots. In the end, Brooks stood his ground, and the proposal will move forward for public review more or less as is. Do we have a gauge on how many people actually complained about this? With so many of these neighborhood temper tantrums, it seems to be a very small group of very loud opponents of an idea that have an effect on policy at the city-wide scale. Also, when will the city stand up and actually say that the on-street parking these pre-existing neighbors enjoy is not now and has never been “theirs” to broker? Much like with other forms of congestion…if you are complaining about it, you are almost certainly contributing to it. Being there first has no actual weight. This is a terrible idea. City council should not be passing laws to protect individuals’ on-street parking. That’s the very definition of comforting the comforted. Such hypocrisy. My building doesn’t provide enough parking so I have to park on the street but all other people must have enough parking so that my on street parking isn’t impacted. Entitlement comes in many forms and it is sad to see that people believe that they are entitled to a parking space and owning a car. There are many forms of transportation options that do not include owning a car in Denver and unless you are handicapped physically you can do anything a person who owns a car does. It only requires thought and planning to utilize the existing transportation options that exist today to live without a car today in Denver. I also think they are being very selective about “high-frequency transit corridors.” The #15 bus line on Colfax runs consistently every 15 minutes, which is a higher frequency than the W light-rail line (which at non-peak hours runs every 1/2 hour). Shouldn’t every lot with a quarter-mile from East Colfax count under this proposal? The whole reason why the 16th and Humboldt development makes so much sense is because its closeness to a major bus and bike route. Shouldn’t lots next to high-use or protected bike lines maybe also fall under this exception? What about when they have both like Colfax/16th or Broadway after the protected bike lane? 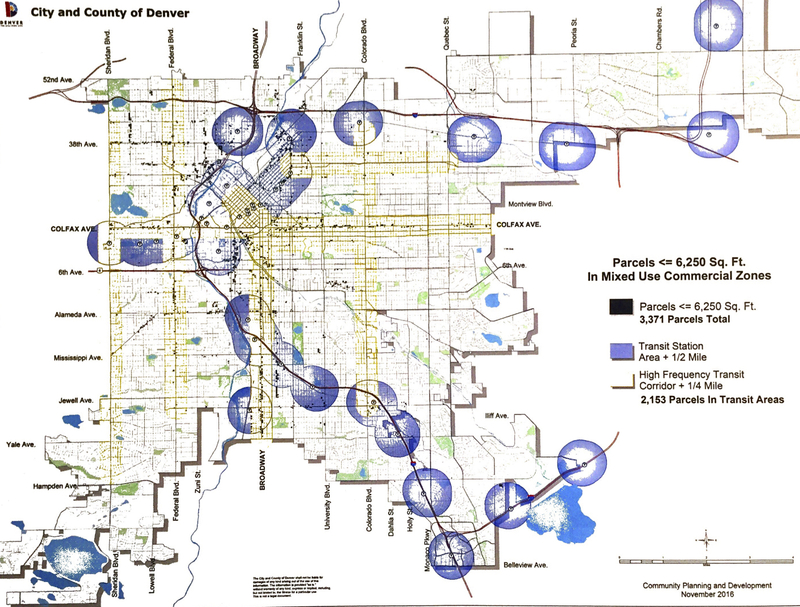 I don’t necessarily think all of Denver should have parking free development, but there are definitely a lot more of areas that should and these exemption feel a bit arbitrary.